Home Last month my column questioned the validity of the Boer goat breed standards. 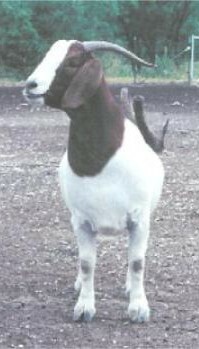 After raising goats for almost 8 years now I have learned a few things about them, and one of the things I have learned is that you cannot tell much about the value of a goat by looking at it. That is the reason I question the value of breed standards that focus on the appearance of the animal. A quick visual inspection will tell you whether the goat is in sound condition or not, and should be done before you purchase an animal or decide to retain it for another breeding season. If you know what you are looking for you will be able to tell if a doe has blown teats that will prevent kids from nursing, if the goat is in obviously poor health, if the goat has weak pasterns and will become a hoof trimming nightmare, if a buck has been castrated or only has one testicle, etc. However, trying to select breeding animals by their appearance can frequently lead you to pick the least productive animals in a herd, especially when you are selecting does. 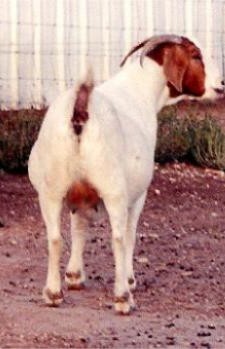 Before continuing I want you to look at the photos of Goat A, Goat B, and Goat C. Take a good long look at each goat's front, side and rear views. All three goats were about the same age when I took the photos, and are from the same herd. They have lived most of their lives on the same pasture, and were exposed to bucks at the same times and for identical periods of time during breeding seasons. All three are registered fullblood Boers. When you are done looking at them assume that you are in the market for a new fullblood doe, and decide which doe you would purchase. Now be honest. You picked Goat A or Goat B didn't you. Goat C from an appearance standpoint is a sorry excuse for a goat. She is physically smaller than the other two. Has a much narrower chest, and if I had taken a photo looking down on her you would see that she is pinched behind the shoulder. Finally, don't forget her cow hocks. Yet, when I made this same choice I picked Goat C. Why would I do such a thing? 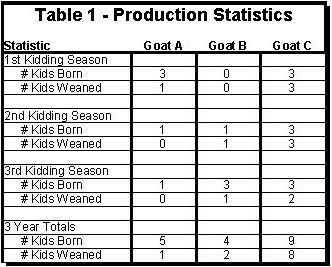 Because I know that Goat C is a kid producing machine, while Goat A and Goat B are by comparison slackers. I don't select my goats based on their appearance, I use production records. I figure that if a goat is productive than there must not be anything seriously wrong with her. A few statistics from their production records may be enlightening, and can be found below. All three of these does were exposed to a buck in the fall of the year they were born, and should have produced kids by their 1st birthday. Only two of the three did, and they both had triplets. However, only Goat C raised her triplets, and she did it without producing a runt on pasture with no supplement. That is a feat even most mature does can't accomplish, let alone a 12 month old doe. The cost to her own development is evident in the photos. I sold those first three little bucks for a total of $1,900.00. Goat A lost two of her three babies, and raised one mediocre doe kid. Goat B didn't produce anything that first year. 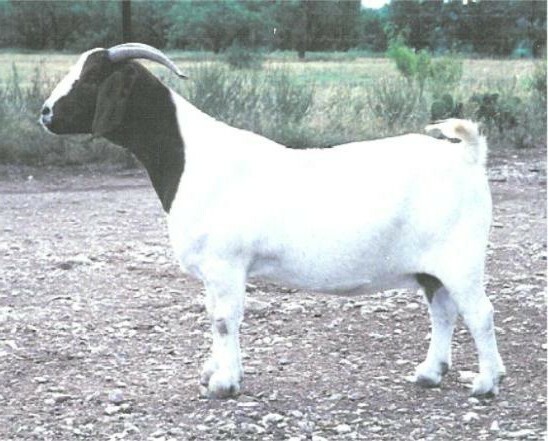 Its no small coincidence that Goat A and Goat B look much better than Goat C. They put most of their energy their first two years into growing larger, instead of producing kids. We tried it again the next year. Again, Goat C produced and raised triplets. Three does this time, and no runts. Goat A and Goat B gave us singles. Its a lot harder to flush those fat does. Goat A's daughter died in a freak accident, and Goat B's son survived to weaning. The next year we bred all three again. Goat C came through with triplet does for a second year in a row, but one showed little interest in eating and died a day later. Goat A's single kid died again. Goat B had triplets, but only one survived. I suspect that she laid on the other two and killed them since they were healthy and nursing, and when I found them they looked like they had been laid on. That same year Goat C's daughters from the previous year all kidded with twins, even though they were only 5 months old when we exposed them to the buck and 10 months old when they kidded. 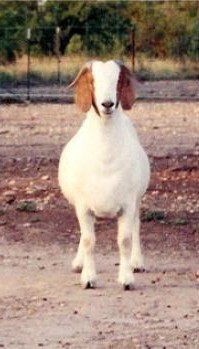 Goat A's now 2 year old daughter produced a single. Like mother, like daughter. 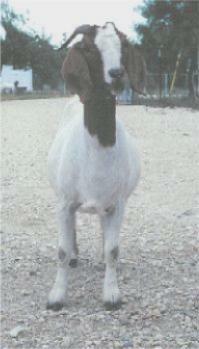 Over a three year period Goat C weaned a total of eight kids, while Goat A weaned one and Goat B weaned two. Pathetic looking little Goat C nearly out produced the two pretty goats combined by three to one, and her daughters matched or out produced the older does before their first birthdays! 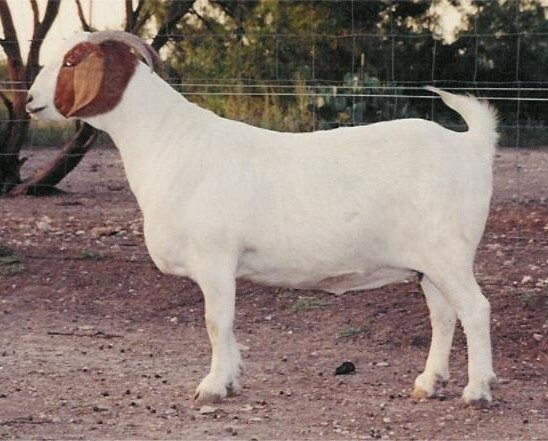 If Goat C is the most productive doe on my ranch, and I believe she was during that three year period, and her conformance to the breed standard is marginal at best, and it is, then what does that say about the value of the breed standards for selecting Boer goats? I raise my Boers on pasture with little or no supplement, so you would think that if there was anything to the breed standards it would affect my goats far more than the typical breeder's goats, and my most productive animals would be my best conformed. Yet my experience has been that if there is any correlation at all it is a negative one. In other words our best conformed goats are the biggest failures in our pasture environment. I have several does that have cow hocks, but I keep them because they are among our most productive. Their cow hocks seem to in no way hinder their ability to get around or feed effectively as evidenced by their productivity, and the same goes for their other faults. If I had the time and had taken pictures over the years I could come up with dozens of comparisons like this between pretty, but unproductive does; and aesthetically challenged, but productive does. In a pasture environment it seems to be very rare for a doe to be both pretty and productive. Life is just too hard under those circumstances for a productive doe to look good. More often than not if you are picking your does based on physical appearance you are picking the least productive animals for your herd. The does that look the best are usually those that are in the best condition, and in a pasture environment the best conditioned does will be those that did not raise any kids, raised a small number of kids, and/or have lousy mothering ability resulting in puny kids and a fat doe. You cannot see the most important part of a doe by looking at her. You cannot see whether she is a good mother or not. You cannot see whether she has the patience to stand around while three kids fight over two teats, and to make sure that the loser still gets fed. You cannot see whether she is smart enough to keep her twins separated and nurse them at different times so that they can both nurse off of her one good teat when the other teat has gotten too large for a kid to nurse off of like one of my older does. That doe weaned 140 lbs of kids off one side of her udder, and supplied my bottle babies with supplemental milk for several weeks off the other side. That huge teat is really easy to milk, and produces a quart each milking. You cannot see whether she will start cleaning her newborn kid's heads first when they are born, or whether she will start at the other end resulting in a dead kid. You cannot see whether she will look before laying down to make sure she isn't going to lay on her own offspring. We've lost several kids that way over the years. You also cannot see the doe's fertility, age at maturity, or dozens of other things that determine whether that doe will be productive or not. All you can see are physical traits that in my experience have nothing to do with determining a does productivity and impact on your bottom line, and in many cases indicate that the doe is less productive than the other does you are looking at. The same is true of your buck. I owned a buck that even though he looked perfectly normal and would have passed a breed standard inspection with flying colors, never sired a single kid. When the vet examined him he could see nothing wrong until he looked at the buck's sperm under a microscope. Every one of his sperm were dead. My deceased herd sire Hakuna Matata is another interesting case. He was a beautiful buck when he was in "show condition." In fact at one point I was offered $6,500.00 for him. In that condition he was wide from front to rear, with one of the longest twists I have ever seen. 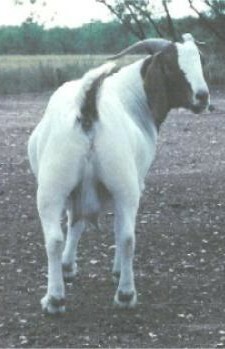 From the rear his hind legs formed an inverted U. He also only successfully bred 50% of the does we exposed him to when he was in that condition. Suspecting that the breeding failure was because of his size I put him on a diet. I wound up with a buck with an average width chest, cow hocks, and hind legs that looked like an inverted V when viewed from behind. I wish I had taken pictures, so you could see how this buck developed faults just from being put on a diet. Oh yeah, he managed to breed all of the does he was exposed to after he lost the extra weight. 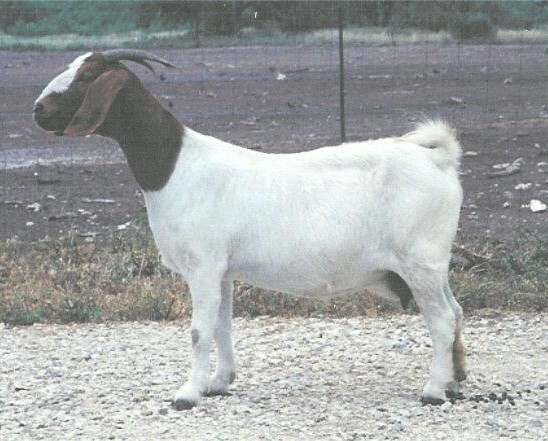 Kind of makes me wonder what Goat C would look like if I let her skip a breeding season, and put her on full feed. Would her cow hocks go away? Would her chest get wider? Would the pinched area behind her shoulder vanish? Neither you nor she needs to worry because I'm not that curious. Besides I'm pretty sure the answer to all those questions is yes given my experience with Hakuna Matata, and with our doe kids that have shown a similar deterioration in appearance after producing their first set of kids on pasture. When selecting breeding animals appearances can be very deceiving. Frequently the best looking animals are the least productive while the worst looking animals are the most productive. Producers would do well to keep that in mind when putting together a new herd or selecting replacements for an existing herd.